U.S. president), Super-Chief (a pre-Columbian superhero in the old West), Space Cabby (an interplanetary taxi driver) and so much more, that says a lot. In the 1950s and early '60s, there was a strong tendency for low-grade sci-fi to creep into the most unlikely DC comics. Batman, that mysterious creature of the night, repeatedly encountered aliens and monsters — in broad daylight, no less. Tomahawk, who fought in the American War for Independence, did the same. Even Mr. District Attorney, based on a radio show about an inner-city law enforcer, ran across the occasional Martian. It took until the April-May, 1960 issue of Star Spangled War Stories (#90), but eventually that trend reached the company's war titles. Robert Kanigher, editor of DC's war line, wrote the cover-featured story, and it was illustrated by penciller Ross Andru and inker Mike Esposito — the same team that was editing, writing and drawing Wonder Woman at the time and, a couple of years later, did Metal Men, both of which were among the quirkier of the '60s superheroes. Apparently, the World War II buffs among DC's readership were indeed looking for that sort of thing, because the dinosaurs were back on both cover and inside two issues later, and two issues after that, then became every-issue regulars. This series replaced French resistance fighter Mlle. Marie, who had been running less than a year. These stories, published under the common rubric "The War that Time Forgot", took place on a remote, uncharted Pacific island where the big guys had, for unexplained reasons, avoided going extinct. A very large remote, uncharted island, apparently, considering the number of extremely bulky carnivores it managed to support. There were no regular characters — most issues featured new G.I. 's stumbling across the unofficial nature preserve and being surprised by what they found. Since some, at least, managed to survive and return to the land of humans, it seems odd that word failed to get around. This went on until the 137th issue (Feb-March, 1968). In #138, Enemy Ace, a World War I German pilot, took over the covers and the lead spot in the magazine, and the dinosaurs were seen no more. Most "War that Time Forgot" stories featured the same creative team as the first: Kanigher, Andru and Esposito. It wasn't until the 1980s that an explanation, of sorts, was offered for the characteristic fauna of Dinosaur Island (as the locale has become known). There seems to have been a connection, through hundreds of miles of solid rock, between it and Skartaris, the setting of DC's Warlord series, an inner-Earth land loosely based on the "Pellucidar" books by Edgar Rice Burroughs (Tarzan, Nyoka). Dinosaurs are, of course, common in such inner-Earth lands, as everyone familiar with the clichés of fantasy fiction knows. Later in the '80s, The War that Time Forgot was revived in DC's Weird War Tales. This time, tho, it didn't catch on. Probably too much competition from that title's regular stars, G.I. Robot and The Creature Commandos. 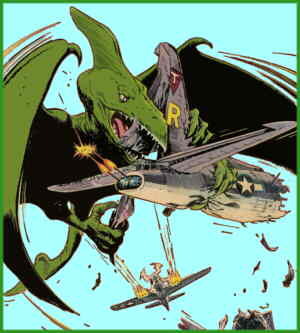 Dinosaur Island was prominently featured in cartoonist Tim Truman's 1998 mini-series, Guns of the Dragon, which also involved Bat Lash, Slam Bradley, Chop Chop (of Blackhawk's outfit) and other DC characters who could plausibly have been alive in 1927, when the story took place. Other than that, it hasn't been seen much lately. But next time the geopolitical situation has American soldiers constantly running back and forth across the Pacific — watch out for dinosaurs! Text ©2002-08 Donald D. Markstein. Art © DC Comics.